On July 26, 1957 QB Tobin Rote of the Green Bay Packers stopped by the team’s offices on the eve of training camp and was stunned to find out he had been traded to the Detroit Lions. He was dealt along with DB Val Joe Walker for HB Don McIlhenny, tackles Ollie Spencer and Norm Masters, and G Jim Salsbury. Chosen in the second round of the 1950 NFL draft out of Rice, Rote, a native Texan, had spent seven years with the Packers. While not always a consistent passer, he nevertheless led the league in pass attempts and completions on two occasions (1954 and ’56) and passing yards in ’56 with 2203. He also topped the circuit in touchdown passes in each of the previous two seasons, with 17 in 1955 (tied with San Francisco’s Y.A. Tittle) and 18 in ’56. Additionally, the 6’3”, 215-pound Rote was a fine runner who led the Packers in ground gaining on four occasions and topped all of the league’s quarterbacks in rushing six times, including a record 523 yards in 1951 that remained the NFL standard for a quarterback until 1971. Along the way he received his share of honors, including first-team All-NFL recognition from NEA in 1955 and selection to the Pro Bowl in ’56. Things had not gone as well for the Packers as a whole as they never posted a record above .500 during that time period. Coach Lisle Blackbourn explained that, while the club hated to give up Rote, it had four quarterbacks on the roster and was in need of offensive line help. Other quarterbacks included Bart Starr (still a work in progress after one season), Babe Parilli, and rookie Paul Hornung – none of whom held the same trade value. Both Rote and Val Joe Walker had talked retirement prior to the trade. Walker had been with the Packers for four seasons, both as a defensive halfback (modern cornerback) and safety, intercepting a total of 15 passes. He ended up not playing for the Lions, who traded him to the 49ers two months later. The veteran Ollie Spencer was considered to be the key to the deal at the time for the Packers. A member of the 1953 team that won the NFL Championship as a rookie, he had spent the next two years in the military before returning in ’56. Norm Masters, meanwhile, played in Canada in 1956 and had only recently been obtained in a trade from the Cardinals. Both regular tackles from the preceding season were gone, with John Sandusky having retired to go into coaching and Bob Skoronski in the service. Forrest Gregg played at guard in ’56 and was also in the military (Gregg returned to the team in 1958, Skoronski in ’59). 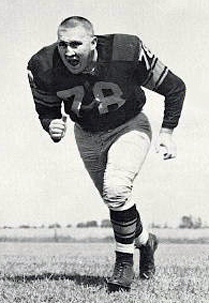 Jim Salsbury had been with the Lions for two years, having been taken in the second round of the 1955 NFL draft out of UCLA. Don McIlhenny was Detroit’s leading rusher after the first four games of the ’56 season, his first after being drafted in the third round out of Southern Methodist, but ran into problems with injuries thereafter and finished up with 372 rushing yards in nine games. In Detroit, star QB Bobby Layne had been bothered with a sore shoulder and then a concussion suffered on a blindside hit in a key game against the Bears late in the ’56 season had damaged the club’s ability to return to the top of the Western Conference. Rote was brought in as insurance. Things got off to a rocky start for the Lions just before the preseason when Head Coach Buddy Parker abruptly quit, but with George Wilson at the helm the Lions went 8-4 and finished in a tie with San Francisco at the top of the conference. Layne and Rote alternated for most of the season with good results as they accumulated nearly identical passing statistics, and when Layne went down with a broken ankle in the eleventh week, Rote took over the job full-time. Detroit won both of the contests to end the regular season and then defeated the 49ers in a stunning come-from-behind victory to advance to the Championship game. The Lions went on to thrash Cleveland for the NFL title by a 59-14 score as Rote passed for four touchdowns and ran for another in the rout. Early in the 1958 season, the Lions traded Layne to Pittsburgh and Rote had the starting job to himself. However, the injury-riddled team dropped to 4-7-1. The veteran quarterback threw for 1678 yards with 14 TDs. Rote struggled with a shoulder injury in ’59 and had a dreadful year, tossing 19 interceptions and only five TD passes. 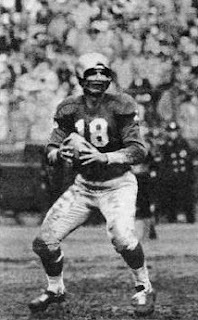 Young Earl Morrall saw considerable action and, with his contract expired, Rote jumped to the Toronto Argonauts of the CFL. After three successful seasons with the Argos, Rote moved on to the San Diego Chargers of the American Football League and guided them to a league title in 1963. A quarterback who experienced success in three leagues, Rote finished his career as a backup with the Denver Broncos at age 38 in 1966. Meanwhile, the Packers didn’t gain much immediate benefit from the big trade, going 3-9 in Coach Blackbourn’s last year and a dismal 1-10-1 under Ray “Scooter” McLean in 1958. The arrival of Vince Lombardi in ’59 marked a significant turnaround, and Norm Masters (pictured below), along with Forrest Gregg, Bob Skoronski, Bart Starr, and Paul Hornung, was a part of it. Masters was with the Packers for eight seasons, including two that ended in NFL titles. Don McIlhenny led the team in rushing in 1957 with 384 yards and returned 14 kickoffs for a 25.9-yard average. In three seasons with the Packers, he rushed for 854 yards, caught 46 passes for 459 more yards, and scored seven TDs before moving on to the expansion Dallas Cowboys in 1960. Ollie Spencer spent two years with the Packers before returning to Detroit in 1959. Ultimately, he finished up his career with the AFL’s Oakland Raiders and stayed on as an assistant coach for many years. Jim Salsbury also spent two seasons in Green Bay, after which his NFL career ended.